Miami Heat center Bosh celebrates after sinking a 3-point shot with less than a second to go to win the game against the Portland Trail Blazers. 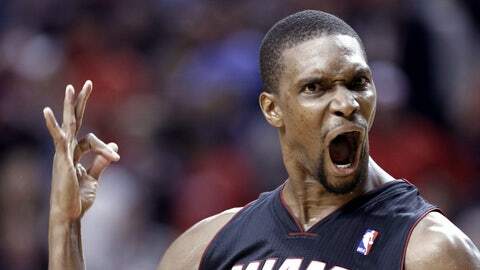 PORTLAND, Ore. (AP) — With LeBron James injured, Chris Bosh took over for the Miami Heat. Bosh had a season-high 37 points, including the go-ahead 3-pointer with 0.5 seconds left, and the Heat beat the Portland Trail Blazers 108-107 on Saturday night. Bosh added 10 rebounds to hand Portland just its third loss at home this season. Wesley Matthews had 23 points for Portland, which had won seven of its previous eight. James injured his right groin and tweaked his left ankle Friday night in a 108-103 overtime loss at Sacramento that snapped Miami’s six-game winning streak. He stayed in the game and finished with 33 points, eight rebounds and eight assists. The four-time NBA MVP warmed up before the game, but was declared inactive about an hour before tipoff. Michael Beasley started in his place. The Blazers held a 94-91 lead halfway through the final quarter, but Bosh hit a 3-pointer to tie it at 96. He made another 3 that put the Heat players on the bench — including James — on their feet as Miami pulled in front 101-98 with 2:03 left. LaMarcus Aldridge’s layup narrowed it to 103-102 with 1:08 to go before Nicolas Batum made all of his free throws after he was fouled beyond the arc by Dwyane Wade. Wade dunked to tie it at 105 with 26 seconds left, but the Heat fouled Batum with 7.7 seconds to go and he made both his shots, setting up Bosh’s 3-pointer when Wade drove right and kicked it back to him well beyond the arc. The two-time defending champions also were without Chris Andersen (sore back), but Ray Allen (right knee tendinitis) and Wade (rest), who both missed the game against the Kings, were back in the lineup. James was the only Miami player to start the team’s first 29 games. Listed as day-to-day, he’ll celebrate his 29th birthday on Monday when the Heat play at Denver to wrap up a four-game trip. Bosh’s follow shot gave the Heat a 19-12 lead midway thought the first quarter. Aldridge hit a 21-foot-jumper that tied it at 24 before the period was over. Damian Lillard’s 3-pointer gave Portland a 32-30 lead and Robin Lopez added a layup as the first quarter came to a close. The Blazers stretched the lead when Dorell Wright’s layup off a dish by Mo Williams made it 43-34. Miami closed the gap but Portland held on to a 62-58 advantage at the break. Bosh’s layup and Rashard Lewis’ 3-pointer to put the Heat in front 71-69 lead midway through the third quarter. Portland quickly reclaimed the lead, pushing it to 86-79 on Williams’ 3-pointer. The Blazers led by as many as nine points. Notes: James had traditionally given the Blazers trouble in Portland, averaging 29.6 points, 9.9 rebounds and 7.2 assists in the past 10 games at the newly renamed Moda Center. … Actress Julia Louis-Dreyfus was at the game. … Miami coach Erik Spoelstra grew up in Portland and played basketball at the University of Portland. … It was the first time this season that the Blazers lost a game they led after the third quarter.